I don’t know where to start. It’s taken me over a week to write this -my brain has been filled so many thoughts. And if you’re reading this, thinking what is she even talking about (umm… that’s when I ask you where have you been the past nine months? 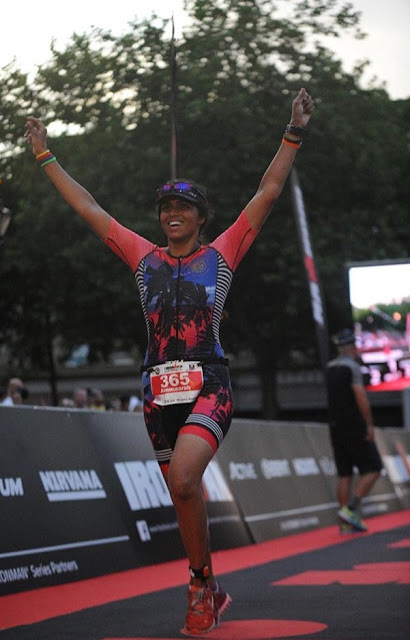 ), I only went and did Ironman UK and crossed the finish line on a warm - and still quite bright - Sunday evening on 15 July. So what did I, someone who had a crippling deep water phobia and only buying my road bike in November 2017 (and going back to the shop to ask if they had sold me a bike without gears… because…err…WHERE WERE THEY?) think of Ironman? Would I do it again? Annual leave from work began on the Wednesday of race week. It’s funny when I think about it, because I never really told anyone at work I was training for Ironman UK. They know I’m fairly active and I’m a part time PT (I stopped that in February when training and doing that alongside my full time job started to affect my sleep and recovery) but that’s about it. I spent most of Wednesday going over my weekend checklist and race day checklist over and over and over again. I’d read stories of people forgetting their helmets, cycling shoes and other bits and bobs – I was determined to not fall at this hurdle before race day. Somehow I managed to pack everything for the weekend into my 2XU transition bag besides my top tube bag and helmet which were clipped onto the bike (FYI – I bought my bag second hand from Gumtree for £20 – the best £20 I’ve spent on a product for Ironman training). Now that’s major for me as usually when I go on a short holiday, I might as well take three suitcases. What I’ve found with IM training, is that you learn to be minimal with your stuff and learn to differ what you actually need versus what you think you might need. Of course, even though I packed everything, on Thursday morning I unpacked it all and checked it all over again. Typical, typical me. Eventually, I caught the train to Horwich Parkway - as soon as I started seeing the Ironman UK road closure signs, that's when it really started to hit me that I was actually doing this. The hotel I was staying at had quite a few other Ironman athletes staying there as well - on checking in, they gave each of us cards wishing us good luck and on race morning they laid out a basic breakfast (which most hotels nearby seem to do). Friday I went back into Bolton town centre for registration. I collected my red transition bag (to put all my kit for the run leg of the race) and blue bag (for my bike kit) and street wear bag (for post race clothes) and got my green band (worn by Ironman virgins) and the orange band (worn by every athlete) then spent some time checking out the expo. Normally I'd never be that bothered by race expos but ooooh Ironman kit is actually quite nice - from the visors to the caps to the tops. I've often wondered whether a lot of people really do buy stuff at expos - well at this one, they were selling out of arm sleeves and certain tops - race weekend hadn't even began! I then took a taxi to Pennington Flash for a practice swim. My training plan had a short swim session on the cards so I took the opportunity to test the waters and see how grimey the waters really were (people kept saying it's full of goose poop....they weren't wrong). Having done a lot of swim sessions at the Royal Victoria Docks in London, I was quite used to grimey water so it wasn't so bad for me. During the swim and walking around Bolton town centre, it was really strange because I had several people coming up to me saying they knew me from social media and wished me good luck. Such a weird feeling being recognised from the internet! The evening ended with a race briefing that I was supposed to attend - unfortunately, they ran out of space and ended up having to hold another session afterwards. I thought this was really bad organisation my Ironman - how did they not foresee that a lot of newbies and athletes would want to attend Friday's race briefing? There were people who had driven in just for the talk and paid parking tickets for that time slot. So I missed the beginners-specific talk and ended up going to the one the next day. oh well! The evening ended with dinner with a group of ladies who were also doing Ironman. over the past few months, I've been part of a Facebook group specifically for the ladies racing Ironman UK this year. Unlike pages like The Ironman UK Journey page, these ladies were far more supportive of each other. We helped each other on our highs and lows and gave each other lots of advice. Plenty of humour also thrown in too (we often joked those funny aero alien looking helmets a lot of guys wear on the bike look like sperm). Throughout the weekend as well, we wore bands we created that said "ironman UK Bolton ladies 2018" - it was such a good idea. Whenever we saw someone wearing a band walking down the street, we'd stop and say hi to each other. With only 15% of the 2500 athletes being female (apparently highest number they've had for IMUK), our female athletes community felt really close-knit and our pre-race dinner felt like we had known each other forever. Guess what I spent Friday night doing? Unpacking my bag and checking everything over and over again. But i also laid out everything to if I had everything. Quite glad I did that, as I found out I hadn't been given Special Needs bags for the bike or run. So Saturday started off differently - I had been speaking to a volunteer team leader on Friday and mentioned in passing that I was going to to take my bike to Pennington Flash by taxi. I had bumped into him later in the afternoon and he insisted I wasn't going to get a taxi and he would someone who would drive me up there. I met Martin (another volunteer) at the registration desk as well, and it turned out he'd pick me up on Saturday. So Saturday early morning, I was in a car with a total stranger being driven to the lake. Found that so funny because in no other life or in London would I ever do that. Honestly, I really mean it when I say that the volunteers at Ironman UK throughout the weekend were an incredible bunch of people. I racked my bike first and took the opportunity to walk around the transition area. Not quite sure how helpful this was because I kept losing the rack with my bike number on race day and wasted a few minutes trying to find it. A couple of people who had qualified for Kona had given me the tip of emptying my bike blue bag next to my bike and taking a photo of it so that when I get back to the hotel I can check if there's anything I may have forgotten that I can put on my bike or trisuit pocket on race day morning. I did that and then deflated my tyres slightly: it was quite a hot day, and I'd heard that apparently can pop if they're left out in the heat for a long time. To be honest, I don't think it would have been an issue for me - I've left my bike in the garden on very hot, dry days without a cover on (oops) and have done long rides without them popping. But, I wanted to reduce as many risks as possible. In the morning of race day, I'd re-inflate those tyres. The blue bike bag was then dropped off and popped into the lake for a quick swim. There was no turning back. After today, I would not be allowed to go back to the blue bag and add anything else into it. After I had a quick dip in the lake, I bumped into another person who recognised me from social media - we were both going to go to the race briefing and drop off our red run bags - she was such a nice person and offered me a lift. I won't name her but shout out to her! In the weeks leading upto Ironman, the lake had been closed off due to toxic algae and we had been warned that the swim may be possibly cancelled. It had been a good sign that the practice swim sessions had been kept on on Friday and Saturday and we only needed the official confirmation at the race briefing that the swim would remain. Thankfully it was! Finally, I popped into Queen's Park to drop off my red run bag - once this was done, my aim was to rest my legs as much as possible as the next day would be a party for the legs so I went back to the hotel. I even watched Love Island for the first time - but just didn't get it ha ha! And I got my race chip - once on my ankle, that's when the pre-race nerves started to kick in. By evening, my support crew arrived and after carbloading on pizza, they helped me put on my race tattoos and I tried and tried to go to sleep before my early morning start for Ironman UK on Sunday. Coming up, in the next blog post I'll be giving you the lowdown of the race.